Vincent Lindon and Galatéa Bellugi star in director Xavier Giannoli's spiritual quest of a movie. Raising questions without knowing the answers, Xavier Giannoli's L'apparition is very much about the journey rather than the destination. Wracked with guilt after his longtime friend and colleague, a photographer, is killed in the Middle East, journalist Jacques Mayano (Vincent Lindon) returns home to France. He is suffering from hearing loss and, even more seriously, Post Traumatic Stress Disorder, for which he refuses offers of treatment. Instead, Jacques becomes more withdrawn than ever, and non-communicative with his wife. So when he is offered a temporary job by a religious official at the Vatican to conduct an investigation, he takes it, even though he has not been a practicing Catholic for many years. The reason why he has been selected is never explained, and I suppose it doesn't really matter; perhaps his skepticism as an admitted non-believer is what decides it. Soon Jacques arrives at a small village in France, where Catholic novice Anna (Galatéa Bellugi) claims to have been visited by the Virgin Mary, more than once. Pilgrims have begun to inundate the village, and the Church is obligated to determine the veracity of her statements. Jacques is accompanied by a small team of Church officials, who all have served on investigative teams before, and are all skeptical. So is Jacques, but it's something to do to take his mind off the death of his old friend, and he plunges onward, doing deep research and leading the investigation with an uncommon, dogged determination. Undoubtedly, it's an attitude that has served him well in his long career as a journalist, and his persistence makes the secular part of the film fascinating, for those like myself who enjoy watching detective stories. As Jacques, Lindon is stoic and logical and mostly unflappable, which helps define him as somewhat different from the large flock of detectives while also retaining certain characteristics that we would expect from his type of character. The other major element of the film is Anna herself. As portrayed beautifully by Bellugi, Anna is just as unflappable as Jacques, at least through much of the running time. She is his flip side, just as devout and devoted and sincere in her spiritual beliefs as he is to his secular doctrines. Quiet and contemplative and very, very thoughtful, L'apparition plays very well at home, perhaps with coffee or another warm beverage on hand. I watched the newly-released DVD from Music Box Films, which looks good. While the DVD only includes a few features, they are very helpful, especially a 10-minute interview with director Giannoli, which covers the key questions I had in mind after watching the movie -- including his intentions, the challenges he faced, and the reaction he received from the Catholic Church. Also quite interesting is the 10 minutes of remarkable audition footage with Bellugi. Just as in the film, her character is quite restrained, yet emanates strong emotions, primarily through her eyes. The theatrical trailer is also included. 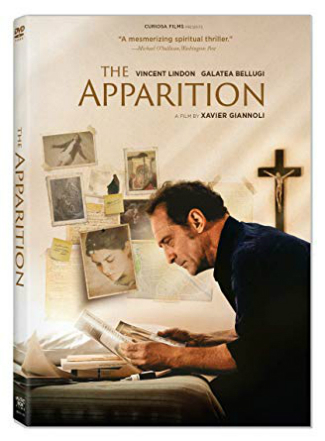 If you have a leaning toward serious dramas that tackle spiritual subjects from a skeptical, questioning point of view, The Apparition may be just the ticket. It's also available for rental and purchase on Amazon and Vudu.